1 What is the Xen Project Hypervisor? What is the Xen Project Hypervisor? The Xen Project hypervisor is an open-source type-1 or baremetal hypervisor, which makes it possible to run many instances of an operating system or indeed different operating systems in parallel on a single machine (or host). The Xen Project hypervisor is the only type-1 hypervisor that is available as open source. It is used as the basis for a number of different commercial and open source applications, such as: server virtualization, Infrastructure as a Service (IaaS), desktop virtualization, security applications, embedded and hardware appliances. The Xen Project hypervisor is powering the largest clouds in production today. Small footprint and interface (is around 1MB in size). Because it uses a microkernel design, with a small memory footprint and limited interface to the guest, it is more robust and secure than other hypervisors. Operating system agnostic: Most installations run with Linux as the main control stack (aka "domain 0"). But a number of other operating systems can be used instead, including NetBSD and OpenSolaris. Driver Isolation: The Xen Project hypervisor has the capability to allow the main device driver for a system to run inside of a virtual machine. If the driver crashes, or is compromised, the VM containing the driver can be rebooted and the driver restarted without affecting the rest of the system. Paravirtualization: Fully paravirtualized guests have been optimized to run as a virtual machine. This allows the guests to run much faster than with hardware extensions (HVM). Additionally, the hypervisor can run on hardware that doesn't support virtualization extensions. This page will explore the key aspects of the Xen Project architecture that a user needs to understsand in order to make the best choices. Below is a diagram of the Xen Project architecture. The Xen Project hypervisor runs directly on the hardware and is responsible for handling CPU, Memory, timers and interrupts. It is the first program running after exiting the bootloader. On top of the hypervisor run a number of virtual machines. A running instance of a virtual machine is called a domain or guest. A special domain, called domain 0 contains the drivers for all the devices in the system. Domain 0 also contains a control stack and other system services to manage a Xen based system. Note that through Dom0 Disaggregation it is possible to run some of these services and device drivers in a dedicated VM: this is however not the normal system set-up. The Xen Project Hypervisor is an exceptionally lean (<65KSLOC on Arm and <300KSLOC on x86) software layer that runs directly on the hardware and is responsible for managing CPU, memory, and interrupts. It is the first program running after the bootloader exits. The hypervisor itself has no knowledge of I/O functions such as networking and storage. Guest Domains/Virtual Machines are virtualized environments, each running their own operating system and applications. The hypervisor supports several different virtualization modes, which are described in more detail below. Guest VMs are totally isolated from the hardware: in other words, they have no privilege to access hardware or I/O functionality. Thus, they are also called unprivileged domain (or DomU). Virtual Device Drivers: Dom0 contains virtual device drivers (also called backends). Xen Project-enabled operating systems: Domain 0 requires a Xen Project-enabled kernel. Paravirtualized guests require a PV-enabled guest. Linux distributions that are based on Linux kernels newer than Linux 3.0 are Xen Project-enabled and usually include packages that contain the hypervisor and Tools (the default Toolstack and Console). All but legacy Linux kernels older than Linux 2.6.24 are PV-enabled, capable of running PV guests. The following diagrams show how guest types have evolved for Xen. HVM Guests: HVM guests use virtualization extensions from the host CPU to virtualize guests. HVM requires Intel VT or AMD-V hardware extensions. The Xen Project software uses QEMU device models to emulate PC hardware, including BIOS, IDE disk controller, VGA graphic adapter, USB controller, network adapter, etc. HVM Guests use PV interfaces and drivers when they are available in the guest (which is usually the case on Linux and BSD guests). On Windows, drivers are available to download via our download page. When available, HVM will use Hardware and Software Acceleration, such as Local APIC, Posted Interrupts, Viridian (Hyper-V) enlightenments and make use of guest PV interfaces where they are faster. Typically HVM is the best performing option on for Linux, Windows, *BSDs. PVH Guests: PVH guests are lightweight HVM-like guests that use virtualization extensions from the host CPU to virtualize guests. 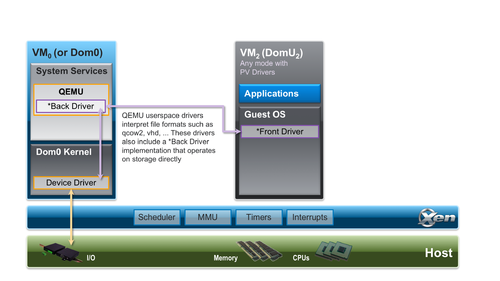 Unlike HVM guests, PVH guests do not require QEMU to emulate devices, but use PV drivers for I/O and native operating system interfaces for virtualized timers, virtualized interrupt and boot. PVH guests require PVH enabled guest operating system. This approach is similar to how Xen virtualizes ARM guests, with the exception that ARM CPUs provide hardware support for virtualized timers and interrupts. IMPORTANT: Guest types are selected through builder configuration file option for Xen 4.9 or before and the type configuration file option from Xen 4.10 onwards in the (also see man pages). Paravirtualization (PV) is a virtualization technique originally introduced by Xen Project, later adopted by other virtualization platforms. PV does not require virtualization extensions from the host CPU and is thus ideally suited to run on older Hardware. However, paravirtualized guests require a PV-enabled kernel and PV drivers, so the guests are aware of the hypervisor and can run efficiently without emulation or virtual emulated hardware. PV-enabled kernels exist for Linux, NetBSD and FreeBSD. Linux kernels have been PV-enabled from 2.6.24 using the Linux pvops framework. In practice this means that PV will work with most Linux distributions (with the exception of very old versions of distros). Full Virtualization or Hardware-assisted virtualization (HVM) uses virtualization extensions from the host CPU to virtualize guests. HVM requires Intel VT or AMD-V hardware extensions. The Xen Project software uses Qemu to emulate PC hardware, including BIOS, IDE disk controller, VGA graphic adapter, USB controller, network adapter etc. Virtualization hardware extensions are used to boost performance of the emulation. Fully virtualized guests do not require any kernel support. This means that Windows operating systems can be used as a Xen Project HVM guest. For older host operating systems, fully virtualized guests are usually slower than paravirtualized guests, because of the required emulation. 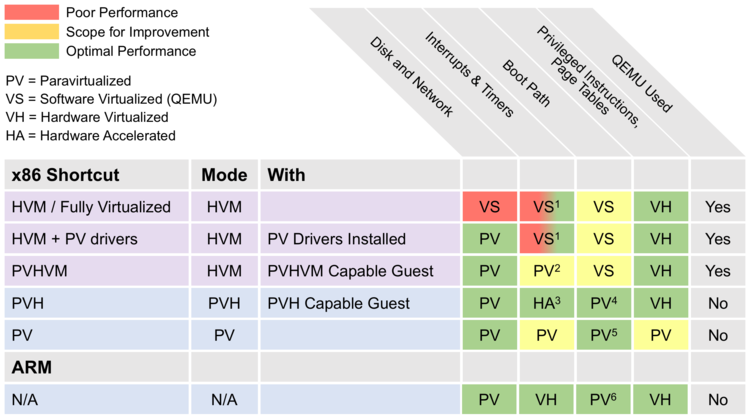 HVM mode, even with PV drivers, has a number of things that are unnecessarily inefficient. One example are the interrupt controllers: HVM mode provides the guest kernel with emulated interrupt controllers (APICs and IOAPICs). Each instruction that interacts with the APIC requires a call into Xen and a software instruction decode; and each interrupt delivered requires several of these emulations. Many of the paravirtualized interfaces for interrupts, timers, and so on are available for guests running in HVM mode: when available in the guest - which is true in most modern versions of Linux, *BSD and Windows - HVM will use these interfaces. This includes Viridian (i.e. Hyper-V) enlightenments which ensure that Windows guests are aware they are virtualized, which speeds up Windows workloads running on Xen. Compared to PV based virtualization, HVM is generally faster. 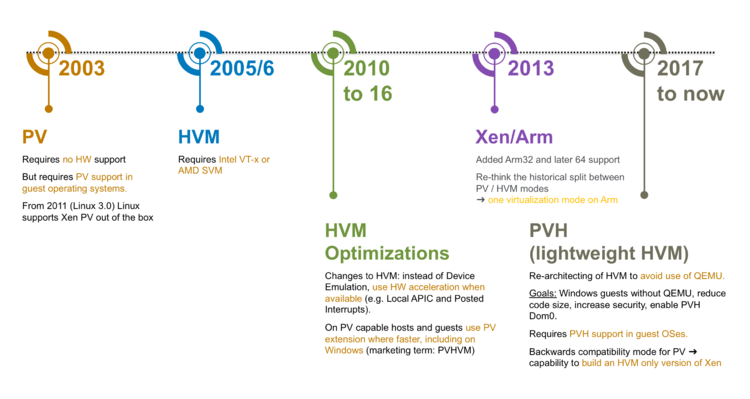 A key motivation behind PVH is to combine the best of PV and HVM mode and to simplify the interface between operating systems with Xen Support and the Xen Hypervisor. To do this, we had two options: start with a PV guest and implement a "lightweight" HVM wrapper around it (as we have done for ARM) or start with a HVM guest and remove functionality that is not needed. The first option looked more promising based on our experience with the Xen ARM port, than the second. This is why we started developing an experimental virtualization mode called PVH (now called PVHv1) which was delivered in Xen Project 4.4 and 4.5. Unfortunately, the initial design did not simplify the operating system - hypervisor interface to the degree we hoped: thus, we started a project to evaluate a second option, which was significantly simpler. This led to PVHv2 (which in the early days was also called HVMLite). PVHv2 guests are lightweight HVM guests which use Hardware virtualization support for memory and privileged instructions, PV drivers for I/O and native operating system interfaces for everything else. PVHv2 also does not use QEMU for device emulation, but it can still be used for user-space backends (see PV I/O Support)..
PVHv1 has been replaced with PVHv2 in Xen 4.9, and has been made fully supported in Xen 4.10. PVH (v2) requires guests with Linux 4.11 or newer kernel. Currently PVH only supports Direct Kernel Boot. EFI support is currently being developed. On ARM hosts, there is only one virtualization mode, which does not use QEMU. 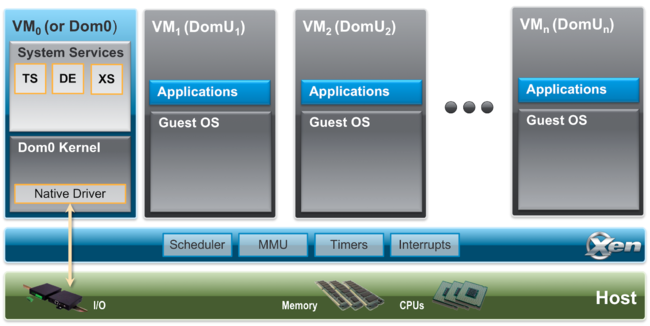 The following diagram gives an overview of the various virtualization modes implemented in Xen. It also shows what underlying virtualization technique is used for each virtualization mode. PVH uses Direct Kernel Boot or PyGrub. EFI support is currently being developed. Xen Project software employs a number of different toolstacks. Each toolstack exposes an API, against which a different set of tools or user-interface can be run. The figure below gives a very brief overview of the choices you have, which commercial products use which stack and examples of hosting vendors using specific APIs. The Xen Project software can be run with the default toolstack, with Libvirt and with XAPI. The pairing of the Xen Project hypervisor and XAPI became known as XCP which has been superceded by open source XenServer and XCP-ng. The diagram above shows the various options: all of them have different trade-offs and are optimized for different use-cases. However in general, the more on the right of the picture you are, the more functionality will be on offer. The article Choice of ToolStacks gives you an overview of the various options, with further links to tooling and stacks for a specific API exposed by that toolstack. 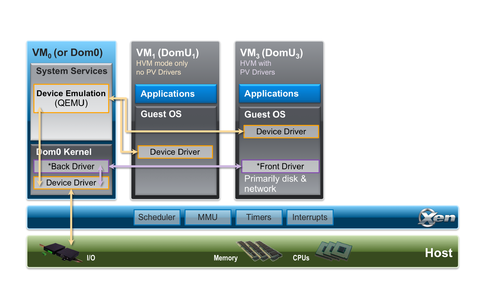 The PV split driver model: in this model, a virtual front-end device driver talks to a virtual back-end device driver which in turn talks to the physical device via the (native) device driver. This enables multiple VMs to use the same Hardware resource while being able to re-use native Hardware support. In a standard Xen configuration, (native) device drivers and the virtual back-end device drivers reside in Dom0. Xen does allow running device drivers in so-called driver domains. PV based I/O virtualization is the primary I/O virtualization method for disk and network, but there are a host of PV drivers for DRM, Touchscreen, Audio, … that have been developed for non-server use of Xen. This model is independent of the virtualization mode used by Xen and merely depends on the presence of the relevant drivers. These are shipped with Linux and *BSD out-of-the box. For Windows drivers have to be downloaded and installed into the guest OS. Device Emulation Based I/O: HVM guests emulate hardware devices in software. In Xen, QEMU is used as Device Emulator. As the performance overhead is high, Device Based emulation is normally only used during system boot or installation and for low-bandwidth devices. Passthrough: allows you to give control of physical devices to guests. In other words, you can use PCI passthrough to assign a PCI device (NIC, disk controller, HBA, USB controller, firewire controller, sound card, etc) to a virtual machine guest, giving it full and direct access to the PCI device. Xen supports a number of flavours of PCI passthrough, including VT-d passthrough and SR-IOV. However note that using passthrough has security implications, which are well documented here. 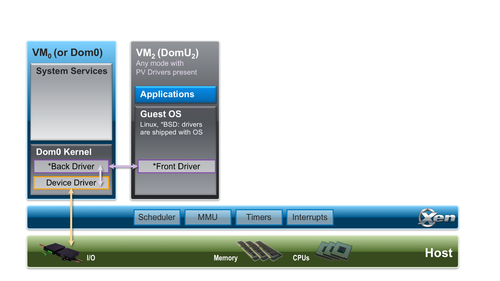 In the first model, a PV front-end driver will talk directly to a PV back-end driver in the Dom0 kernel. This model is primarily used for plain networking and storage virtualization with LVM, iSCSI, DRBD, etc. Note that the above figures are simplified representations of what is happening in a Xen stack, as even in the simplest cases there will be the Linux/BSD network/block stack in between the back-end driver and the real hardware device. In the second model, a QEMU user-space backend will interpret formatted file data (such as qcow2, vmdk, vdi, etc.) and presents a raw disk interface to its own PV back-end implementation. From a user's or guests' perspective, there is no visible difference to whether a back-end driver runs in user or kernel space. Xen will automatically choose the appropriate combination of front and back-end drivers based on the configuration option used. The following diagram shows how Device Emulation is used in isolation and used together with PV I/O Support. This support is only available for HVM Guests and primarily used to emulate legacy devices that are needed during the boot process of a guest. It is also used for low bandwidth devices, such as the serial console for HVM guests. Step 2: set up a network bridge (xenbr0) in Dom0. This is distro specific: you can find a number of examples on how to do this here. As we outlined earlier, a paravirtualised network device consists of a pair of network devices. The first of these (the frontend) will reside in the guest domain while the second (the backend) will reside in the backend domain (typically Dom0). The frontend devices appear much like any other physical Ethernet NIC in the guest domain. Typically under Linux it is bound to the xen-netfront driver and creates a device called ethN. Under NetBSD and FreeBSD the frontend devices are named xennetN and xnN respectively. The backend device is typically named such that it contains both the guest domain ID and the index of the device. Under Linux such devices are by default named vifDOMID.DEVID while under NetBSD xvifDOMID.DEVID is used. Step 3: To connect these virtual network devices to the network, a vif entry is added for each backend device in the respective domain configuration file. By default, most Xen toolstacks will select a random MAC address. Depending on the toolstack this will either be static for the entire life time of the guest (e.g. Libvirt, XAPI) or will change each time the guest is started (e.g. XL). For the latter, it is best practice to assign a defined MAC address, such that IP addresses remain static when used with a DHCP server. Install the OS using normal operating system installation procedures: aka using an ISO based installation medium, network installation (e.g. PXE) or similar. Create clones of a previously created VM instance. 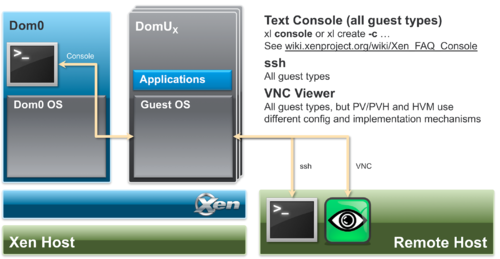 Note that pre-built Guest VM Images for Xen are available from a number of sources. Clones can be used to set up a network of identical virtual machines, and they can also be distributed to other destinations. Some Xen project based products and distributions provide the capability to export and import VM images (e.g. any libvirt based Xen variant, XenServer and XCP-ng): xl does not provide such functionality: however, saving the master disk image and configuration file and creating a clone using a file copy of the disk image and configuration file (which will need to be adapted) is sufficient. Some Xen based products (e.g. XenServer and XCP-ng) as well as the libvirt toolstack provide a mechanism called templates to streamline the process of creating VM clones. Templates are instances of a virtual machine that are designed to be used as a source for cloning. You can create multiple clones from a template and make minor modifications to each clone using the provided template tooling. If you use XenServer or XCP-ng, you typically will not be interfacing much with Dom0. That is unless you are a power user. The Xen Project hypervisor is available as source distribution from XenProject.org. However, you can get recent binaries as packages from many Linux and Unix distributions, both open source and commercial. Xen Project Source Distributions The Xen Project community delivers the hypervisor as a source distribution, following the delivery model of the Linux kernel. The software is released approximately once every 6-9 months, with several update releases per year containing security fixes and critical bug fixes. To build Xen Project software from source, you can either download a source release or you can fetch the source tree from the source repository. Each source release and the source tree contain a README file in the root directory, with detailed build instructions for the hypervisor. The release notes for each release also contain build instructions and so does the Compiling Xen Project software page. Xen Project software in Linux/Unix Distributions Most Linux and many Unix distributions contain built binaries of the Xen Project hypervisor that can be downloaded and installed through the native package management system. If your Linux/Unix distribution includes the hypervisor and a Xen Project-enabled kernel, we recommend to use them as you will benefit from ease of install, good integration with the distribution, support from the distribution, provision of security updates etc. Installing the hypervisor in a distribution typically requires the following basic steps: a) Install your favourite distribution, b) Install Xen Project package(s) or meta-package, c) check boot settings and d) reboot. After the reboot, your system will run your favourite Linux/Unix distribution as Control Domain on top of the hypervisor. This table contains a list of Xen Project resources for various Linux and Unix distributions. Arch Linux is a lightweight and flexible Linux® distribution that tries to “keep it simple”. A security-oriented, lightweight Linux distribution based on musl libc and busybox. CentOS is an Enterprise-class Linux Distribution derived from sources freely provided to the public by a prominent North American Enterprise Linux vendor. CentOS conforms fully with the upstream vendor's redistribution policy and aims to be 100% binary compatible. (CentOS mainly changes packages to remove upstream vendor branding and artwork.) CentOS is free. Xen packages in CentOS 6 and commercial support are also available from "Xen made easy!" Xen packages from "Xen made easy!" The Debian project produces an entirely free operating system that empowers its users to be in control of the software running their computers. Fedora is a RPM-based distribution with a 6-month release cycle, and is the community-supported base of RHEL releases. Fedora 16 and newer provides full Xen support out of the box. FreeBSD® is an advanced operating system for modern server, desktop, and embedded computer platforms. Finnix is a sysadmin utility Linux LiveCD, and includes out-of-the-box Xen Project guest support. Gentoo Linux is a special flavor of Linux that can be automatically optimized and customized for just about any application or need. Extreme performance, configurability and a top-notch user and developer community are all hallmarks of the Gentoo experience. NetBSD is a free, fast, secure, and highly portable Unix-like open source operating system. Oracle Corporation distributes Oracle Linux the Unbreakable Enterprise Kernel. Oracle states that the Unbreakable Enterprise Kernel is compatible with RHEL, Oracle middleware and 3rd-party RHEL-certified applications. Oracle Linux supports KVM, Xen Project, and Oracle VM Server for x86, which is based on Xen. openSuSE is a free and Linux-based operating system for your PC, Laptop or Server. RHEL 6.x does not include the Xen Project Hypervisor. But, a Dom0 capable kernel, Xen Project hypervisor, and libvirt packages for use with RedHat Enterprise Linux 6 and its derivatives are available from either the Xen4CentOS project or the "Xen made easy!" effort. Xen Project packages from "Xen made easy!" The following tutorial allows you to experiment with Xen running within VirtualBox. The Xen Project community contains many helpful and friendly people. We are here for you. There are several ways to get help and keep on top of what is going on! Main Mailing Lists XenProject.org maintains a number of mailing lists for users of the hypervisor and other projects. English is used by readers on this list. xen-users is the list for technical support and discussions for the Xen Project hypervisor. If you are not sure where your question belongs start here! Internet Relay Chat (IRC) is a great way to connect with Xen Project community members in real time chat and for support. #xen is the channel for technical support and discussions for the Xen Project hypervisor. If you are not sure where your question belongs start here! Check out our IRC page if you are not familiar with IRC. If you find a bug, you can report bugs against the software. Before you raise a bug, please read Reporting Bugs! The Xen Project community releases the Xen Project Hypervisor with a release cadence of 6 months (in June and December of each year). Roadmap information is tracked at Xen Roadmap. You can find information on the maintenance release cycle at Xen Project Maintenance Releases. Guest VM Images provides pointers to various preinstalled guest images. This page was last modified on 5 November 2018, at 19:05.